The symptoms of head trauma are very similar to those of poisoning and the quicker the animal can be seen by a rehabber the better. Some symptoms of head trauma: listing to the side - walking in circles - looking and acting dizzy - blood from nose or mouth. Some symptoms of poisoning: listing to the side - walking in circles - looking and acting dizzy - blood from nose or mouth. Handle with caution - squirrels have very long sharp teeth and strong jaws. While they are not at all aggressive by nature, injury places them in a defensive state and they may claw or bite to avoid capture. Leather gloves offer some protection but a good bite will puncture leather gloves or at least bruise you. Other trapping and capturing techniques - a box or a cage. Some small animal cages detach from the base and are useful for quickly placing over an injured animal - then a flat cookie sheet can be slid under the animal. 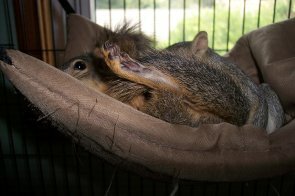 Place soft cloths on the base of the cage and slip the cookie sheet out - landing the squirrel in the base. 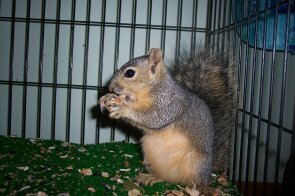 Squirrels calm down in the dark so cover the cage with a cloth that will make it dark within. Handle the squirrel as little as possible. Keep the squirrel warm - human body temperature is a good guideline. 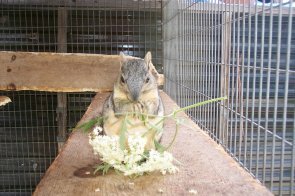 Place the box or cage away from other animals and keep the area as quiet as possible.